This year’s iteration of their annual meeting offered a sense of where both sides are on border management issues. On December 10, Vietnam and Laos held another iteration of a key meeting designed to help them manage the challenges and opportunities around their shared border. While the interaction was part of a regular stream of meetings held between the two countries on this front, it nonetheless held significance as it illustrated the continued importance of border issues as part of the broader relationship between the two Southeast Asian countries. As I have noted before in these pages, though there are various components to the Vietnam-Laos defense relationship, border management is a key issue, being both a source of opportunity (in terms of border trade) and challenge (in terms of managing issues such as drug trafficking or migration) for both Southeast Asian states. Delegations between the two sides meet frequently at various levels to talk about border issues, including an annual meeting usually held toward the end of the year to assess progress made, with the last one held in Vietnam in December 2017. This week, the defense aspect of ties was in the spotlight again with the holding of this year’s iteration of the Vietnam-Laos border meeting. The 28th iteration of the engagement took place on December 10 in the Lao capital of Vientiane. The Vietnamese side was headed by Deputy Foreign Minister and head of the National Border Committee Le Hoai Trung, while the Lao side was led by Foreign Minister and head of the Laos-Vietnam border committee Saleumxay Kommasith. As is typical of such meetings, the discussions centered on reviewing cooperation in 2018 and discussing future avenues for collaboration in 2019 as well. 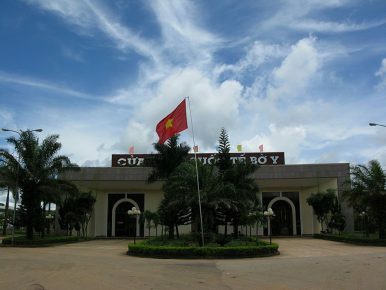 Vietnamese state media said the two sides had assessed progress on ongoing collaboration, including the development of the inland border gate system; cooperation between localities covering the economy, culture, education, tourism, and healthcare; and joint efforts in upgrading existing border markers and adding new ones as well. In addition, the two sides also previewed some priorities for 2019. One of the key lines of effort mentioned was implementation of an agreement they had reached on managing shared challenges such as undocumented migration and marriages. They also discussed other areas such as compliance with legal documents on border management as well as the opening and upgrading of border gates. Unsurprisingly, few additional specifics were publicly disclosed about the private discussions between the two sides. But both sides plan to hold subsequent interactions, including a conference before the end of the second quarter in 2019 to review the pilot of a single window mechanism at the border gate between the Vietnamese town of Lao Bao in Quang Tri province and Densavan in the Laotian province of Savannakhet. In addition, the 29th iteration of the annual border meeting is set for the fourth quarter of 2019 in line with the existing schedule. Vietnam-Laos Border Patrols Highlight Bilateral Defense CooperationDefense Visit Puts Vietnam-Laos Military Ties Into FocusWhat’s Next for Vietnam-Laos Military Ties in 2018?What’s Next for Vietnam-Laos Border Cooperation?What’s in the First Vietnam-Laos-Cambodia Trilateral Border Exchange?